We are thrilled to let you know that Toyota Australia will continue to support the Adelaide Football Club well into the future, with their new agreement to run until the end of 2023! This will ensure that one of Australian sport's most enduring partnerships will enter it's fourth decade, with Toyota having been with the Crows since their inception. Toyota will remain on the front of the Adelaide Crows club gurnsey whilst also playing an integral role within the Club's matchday activations, including HiLux Hill at Adelaide Oval. 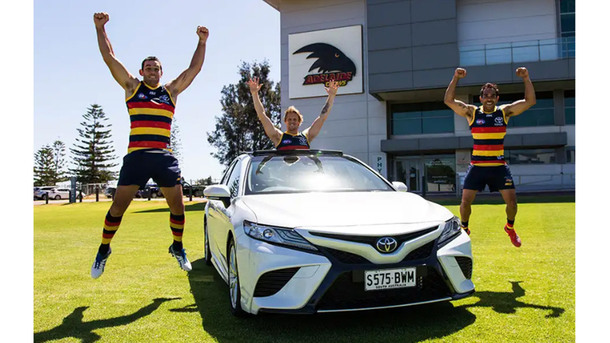 Amongst the other benefits, the Crows will support Toyota’s Good For Footy program which has so far provided more than $5m funding to grassroots clubs across the country. Both organisations are committed to raising awareness of the program and the benefits it delivers to local communities, particularly in South Australia. The CMI Toyota team also look forward to our popular Crows Family BBQs continuing to occur each year so that our guests have the chance to meet their favourite Crows stars at each of our three locations. We wish the Adelaide Crows all the best for a successful 2019 season.